A little while ago I did a post on Demeter's New Car Fragrance. I was so surprised at how much I loved it. I'm even more surprised at how much I love Kitten Fur. Not at Jasmine, which is my favorite scent of all. Jasmine reminds me of nights in Greece. When the Jasmine blooms in Greece, the scent is carried at night and it smells divine. Demeter has captured that scent perfectly in a tiny bottle. Kitten Fur smells light and powdery like a kitten would smell, earthy and new kind of like milk and powder. Cats. Love them or hate them. There is no in between. But everyone loves Kittens! Now after 15 years of effort, Demeter has captured the olfactory essence of the warmth and comfort of that purrfect spot, just behind a kitten's neck. A fragrance that truly purrs. And so, will anyone who experiences it. 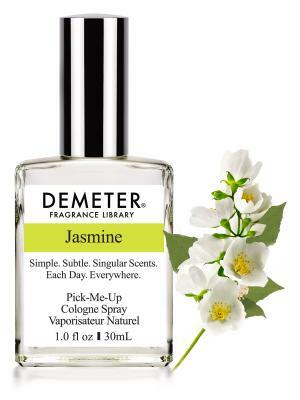 Demeter’s Jasmine is an exotic, sweet, warm floral bouquet. It is the experience of the living flowers picked on a beautiful spring night. Captivating and seductive, they’ve taken their original scent and made it even better. One of the flowers most valued by perfumers, and grown in Grasse, France, its mood-inducing scent is one of the most distinct of all natural odors. Demeter has so many different scents to choose from and ways to wear it or have it in your home. You can choose to wear it or have diffuser oil, body lotion, shower gel, massage and body oil, or reed diffusers for some of them. They even have sampler sets at Black Friday prices. Demeter makes 300 scents from A-Z. Even Pomander is one. I used to make Pomanders. Give Demeter a try. You won't be sorry. 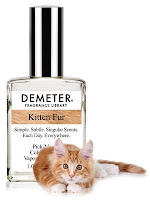 Demeter Kitten Fur and Jasmine are available online at www.demeterfragrance.com. Anything you buy here makes a wonderful gift for a woman or man in your life. Give the gift of scent to someone as a way of saying "I love you". You have 300 to choose from. There are specific holiday scents for the occasion or scents for any occasion.